We’d love your help. Let us know what’s wrong with this preview of Training from the Back of the Room! by Sharon L. Bowman. To ask other readers questions about Training from the Back of the Room!, please sign up. Be the first to ask a question about Training from the Back of the Room! Parece que umas poucas instruções sobre treinamentos, de forma resumida, teria sido mais útil ( acompanhada de um catálogo de variantes para lições). This book comes highly recommended, and I'm certain that I need it, yet it doesn't work for me at all. I occasionally do highly technical training (in advanced computer programming), and while I'm on firm footing when it comes to my knowledge of the technical material, I have no illusions about my abilities as a trainer. Sometimes I manage to keep my students engaged, but it also happens that I fail to catch their attention. Certainly, I could do better, so I'd hoped this book would help me. Perha This book comes highly recommended, and I'm certain that I need it, yet it doesn't work for me at all. Perhaps it will. I have no problem with its message, but I absolutely can't stand the way it's delivered. First, the book is ugly. As an adult, well-educated person, I shouldn't let that affect me, but I can't help it. I constantly had the impression that the book is set in Comic Sans. It isn't, but somehow it feels that way. Wide margins, plenty of white space, and extensive use of clip art has that effect, I suppose. It simply looks cheap to a degree that distracts from the message. Second, it's repetitive. It states the same points over and over. It's repetitive. It repeats points. It's repetitive. Third, it leaves me feeling more inadequate than before. I clearly understand what I do wrong as a trainer, but I don't know what to do instead. Sure, the book boasts "65 ways to step aside and let [students] learn", but most of the practical ideas seem like they're aimed at a different type of training. The basic premise of the book is that "learning is finding out what you already know". While I don't take such an assertion at face value, I can see how it would apply to corporate training like introductions for new hires, compliance training, instruction in procedure, etc. How this tenet can be applied to teaching property-based testing, category theory, and like topics, is unclear to me. And now I know why I disliked many of the trainings I've been to. Inspired me to apply this when I will run a training. I struggled through the first few chapters, learnt a bit from the rest, and managed to adopt one or two ideas. Книга про эффективное построение обучения: тренинга, лекции, дистанционного курса и т.д. Основная мысль: обучение - это процесс созидания. Человек хуже всего учится чему-либо, пассивно слушая, но в то же время многие образовательные форматы построены именно с принципом "обучателя" в центре процесса. Согласно особенностям нашего мозга, мы учимся эффективнее, когда учим кого-то другого. Здесь мне вспоминается пирамида обучения Дейла. В книге приводится концепция построения эффективного обучения 4C Книга про эффективное построение обучения: тренинга, лекции, дистанционного курса и т.д. Основная мысль: обучение - это процесс созидания. Человек хуже всего учится чему-либо, пассивно слушая, но в то же время многие образовательные форматы построены именно с принципом "обучателя" в центре процесса. Согласно особенностям нашего мозга, мы учимся эффективнее, когда учим кого-то другого. Здесь мне вспоминается пирамида обучения Дейла. В книге приводится концепция построения эффективного обучения 4C и примеры практик по каждому элементу. 1. Before the training, use an activity to engage the learners with the material. 2. During the training, teach them only what they need to know, keep lectures to ten minutes max, then break it up with an interactive exercise. 3. End the training with teach-back activities. 4. After the training, stay in touch with the group to nudge them toward actually using what they learned. This book is a great addition to Learning 3.0 – How Creative Workers Learn. Read it, if you are involved in education. The book offers a simple, 4-step framework for creating brain-friendly learning environments. 4C – Connections, Concepts, Concrete Practice, Conclusions. 3) Sl This book is a great addition to Learning 3.0 – How Creative Workers Learn. Read it, if you are involved in education. The book offers a simple, 4-step framework for creating brain-friendly learning environments. 4C – Connections, Concepts, Concrete Practice, Conclusions. Do you want to deliver successful trainings that stick in the participants minds? This is a fantastic and incredible helpful book for trainers. All those who still use presentations with slide shows in their trainings should definitely read this book. It will give them an understanding how humans really learn and a bunch of ideas and concrete practices to improve the structure of their trainings. But even those who already use interactive training techniques will probably gather new insights and Do you want to deliver successful trainings that stick in the participants minds? An interesting perspective on training. Clearly presents modern science how brain learns, suggests many ways how to make learners participate in knowledge passing. Some parts however seem biased by author's experience, so in my opinion you need to carefully pick what will work for you. The book is HUGE! It's fundamental and complex to get it in a first/single read. I'm using it as a handbook already for trainings design and that's just a tip of the iceberg. Foundational. Sharon's superb contribution to those of us who speak and teach to groups. Everyody learns differently, but no one learns from DBP (death by powerpoint). Check out my TBRCal.com site for blogs and certified Training from the Back of the Room! classes. Pure gold for every training and workshop facilitator! This book is great to use it as a handbook while you are preparing for training. One reading is definitely not enough. I liked it. The author ties learning theory and cognitive psychology to training behaviors, something we should all do all the time. However, I didn't find the book as easy to use as the author intended. That said, there is one take away that can absolutely make a difference for anyone. The author puts great emphasis on graphical Concept Maps as a way of increasing retention. Concept Maps are nothing more than a visual hand-out that the trainer has the participant use in context of the session s I liked it. The author ties learning theory and cognitive psychology to training behaviors, something we should all do all the time. However, I didn't find the book as easy to use as the author intended. That said, there is one take away that can absolutely make a difference for anyone. The author puts great emphasis on graphical Concept Maps as a way of increasing retention. Concept Maps are nothing more than a visual hand-out that the trainer has the participant use in context of the session so as to reinforce what is being taught. Sort of like helping the participant along in their note taking.... These are not PowerPoint print-outs, but interactive items. I've used them sporadically, but will make a conscious effort to use them more routinely going forward. I recently finished this book while I was I'm the midst of redesigning all of our courses right before a major teaching engagement. During that process I found the information in this book extremely useful, both in helping to reframe my mindset as I built training and in helping me reorganize my materials into something that should be more fun and more memorable. This was not my favorite book I have ever read, but the information in it is definitely worth the time. One last thing is that the book I recently finished this book while I was I'm the midst of redesigning all of our courses right before a major teaching engagement. This is a mandatory reading on the subject of training, and more specifically on the interaction between a trainer and the trainees. It promotes a landmark evolution of the trainer posture, with more a facilitator attitude. The text is divided in 4 parts, mirroring the "4C" of the learning technic promoted here. The text itself is an incarnation of the approach. Unfortunately it makes a strange reading experience, rather inconfortable. so far quite nice and gave me already very good ideas about how to create sessions that are worth the attendees time. After the second walkthrough and doing a crash-course about it I'm absolutely convinced that this is a must read for anyone doing trainings/workshops. The feedback that you get from the trainings/workshops is your best indicator that you apply it the right way! 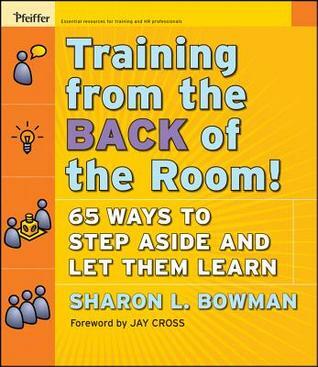 Sharon Bowman is quite likely the most intelligent and practical voice in learning and human performance today. Her books are a delight to read, more importantly her ideas are phenomenal - connecting with and reading Sharon has made my practice infinitely better. If you're a trainer or have a responsibility for teaching anyone (kids, adults, clients) pick up a book by Sharon and get after it! Great, concrete training ideas for adults based on brain research and author experience. I've tried some of her suggestions with success and look forward to implementing more of her ideas. If you're a trainer or teacher, read this book! This book proposes a clear structure for practice-based trainings along with an ample amount of exercises. I was able to use a couple of these exercises since reading the book and they actually delivered on their promise. Good book, I just don't enjoy presentations where you have to be an active participant. Just a personal preference. Fantastic, a must read for anyone involved in training / teaching others. This is to training what Agile is to software development. try it. Sharon Bowman has a lot of great books. The book was easy to understand and it will serve as a great addition to a trainer's bookshelf! Good book if you are doing a lot if training classes. Awesome! It's very useful book for any trainers or coaches. 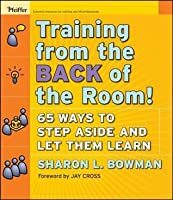 Sharon Bowman is the president of Bowperson Publishing & Training, Inc. She has been a professional speaker, author, teacher, and trainer for almost forty years. She works with businesses and educational institutions that want to offer exceptional in-house training and professional development programs. 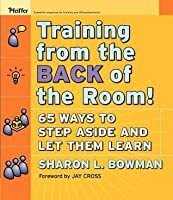 Sharon is a popular speaker at both the American Society of Training and Development (ASTD) Sharon Bowman is the president of Bowperson Publishing & Training, Inc. She has been a professional speaker, author, teacher, and trainer for almost forty years. She works with businesses and educational institutions that want to offer exceptional in-house training and professional development programs. Sharon is a popular speaker at both the American Society of Training and Development (ASTD) and the Training Magazine Events annual conferences. She is the author of eight popular training books, including the best-selling Pfeiffer/Wiley books titled The Ten-Minute Trainer and Training from the BACK of the Room. Her newest book is Using Brain Science to Make Training Stick. Sharon practices what she preaches by facilitating highly-interactive, informative, and unforgettable learning experiences. Whether the format is a conference keynote or breakout session, a half-day, full-day, or multi-day training, or webinars and other online learning venues, learners never sit long: they actively participate throughout the entire learning event. The experience is always EPIC: emotional, participatory, image-rich, and connected to their lives.